When applying for a home loan modification, a key component of the application is the hardship letter, the homeowners’ description of the financial setbacks they’ve experienced that resulted in their inability to pay their monthly mortgage. Not everything qualifies as a bona fide financial hardship. You need to prove that you experienced a genuine hardship and that it compromised your ability to pay. Job loss or relocation, such as a layoff or reduction in force (RIF). Income reduction, such as a wage reduction or loss of overtime. A failed business or one that’s suffering from an economic slowdown. Newborn child, namely maternity leave and the increased expense of having another dependent. Some lenders even consider adoption a hardship. Death in the family, especially if the person who passed away was helping to make the payments. Payment shock, as in a bump in the interest rate on an adjustable-rate mortgage. Illness or injury that either reduces income or increases medical expenses or both. Too much debt accumulated over time. Gambling by one of the household’s wage earners who’s currently seeking treatment. Alcohol or drug dependency of one of the household’s wage earners who’s currently seeking treatment. Incarceration of one of the household’s wage earners. What event or series of events caused the financial hardship that has made your monthly mortgage payments unaffordable? When did the hardship occur? Provide a specific date or range of dates. Is the hardship temporary or permanent? A temporary hardship could be medical bills not covered by insurance, an injury or short-term illness, or a job layoff. A permanent hardship is more like a death in the family or a divorce or separation. How badly do you want to keep your home? If you really don’t care about keeping the home, the lender may not care enough to try to negotiate a loan modification. Are you behind on your house payments? If yes, how many months are you behind? What’s the total dollar amount of your deficiency? Can you afford to make a house payment? If yes, how much can you afford to pay? What are you doing to address the root cause(s) of the hardship (if you have any control over them) and recover your financial footing? This can be anything from budgeting more carefully to finding a new job or liquidating assets. 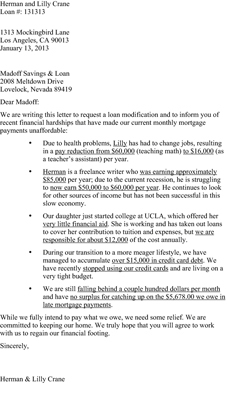 The goal of your hardship letter is to convince your lender that you’re worthy of a loan modification. It should show that you meet all the lender’s eligibility requirements and convince the lender that you’re committed to a long-term solution and able to follow through. You should keep your hardship letter short — one page is plenty. Underline the most important points, including the terms of your current loan, the total deficiency amount (if any), the date on which the trouble began, anything you’ve done to resolve the problem, and so on. The following document provides a model for you to get started. Your hardship letter may look something like this. Click here to view this letter.